I must begin by asking your forgiveness. There's my title: "How to Succeed at Forgiveness Without Really Trying." Yet I must confess that I have no intention of explaining how to succeed at forgiveness without trying. The truth, in fact, is that -- except for small offenses for which casually tossed-off forgiveness suffices -- you have to try. Forgiveness takes work. It's a repair of relationship, and it requires the work of both parties: intentional, deliberate, and often hard. Forgiveness is a grace, and you know the saying about grace: it’s free, but it ain’t cheap. To “succeed” at forgiveness takes intentional commitment to a process. Then there's this approach . . . So, yes, sometimes it’s OK to treat forgiveness in that way – for little things like forgiving me for my title. Other times the road to forgiveness is harrowing, soul wrenching -- about the hardest thing a person can do. Here’s an example of what I’m talking about. The 1982 film Gandhi covers the violent rioting in which Muslim and Hindu mobs are forming -- attacking and killing each other all over India. At one point Gandhi makes plans to meet with Jinnah, a Muslim leader, to try to bring peace. One of Gandhi’s followers, a Hindu, cries out to Gandhi out of deep distrust of the Muslims, “don’t do it." But it doesn’t stop. Gandhi goes on a hunger strike – refusing to eat until the violence stops. And the fighting stops. In the film, we see Gandhi weak and in bed from fasting. Leaders of the fighting factions come in, throw down their swords and promise they will fight no more. One man then pushes through and flings bread on Gandhi. The man is astounded. He’s just been asked to do the hardest thing he could be asked to do. Forgiveness is more typically about restoring relations with a particular person, perhaps a specific group. In this case, the man seeks to restore right relations with his world. And to do that will require turning upside down the hate and division and the loyalties that have come to define his life. As all of this sinks in, the man’s stunned expression seems to turn from disbelief to wonder. That’s a subtle thing, the shift from incredulity to wonder. It’s the shift of glimpsing a way out, when you thought there was no way out of the hell of your life. The man turns to go. Stops. Turns back to Gandhi. Gets on his knees and bows to the ground. The man has, we hope, committed to a very long process. A dozen years, at least, of raising a child – and adjusting to raising that child in a faith that, for now, he hates. For this man, his path to forgiveness will be long, and gradually unfolding. In fact, it may make sense to say that in a case like this, moving toward forgiveness will be the rest of his life. Always headed there, never there. The way that folks in Alcoholics Anonymous or Narcotics Anonymous – the recovery community – have a saying: Always recovering, never recovered. There's a lot of wisdom in that for all of us. And as you engage in your spiritual practice and wrestle with your own demons and distractions, having reached the point at which you can no longer deny them, you might put it: Always becoming enlightened, never enlightened. I can speak to you as a man who did find a child – about this high – of a different religion, different culture, different language. Yency Contreras was 17 when LoraKim and I met him while offering worship services at his detention facility in El Paso. (The recent documentary film, "Which Way Home" chronicles a story startlingly similar to Yency's trip to the US in 2004.) Our relationship, seven years so far, has been many things. We were not called upon, as the man with Gandhi, to actively raise him in a different faith – he had already been mostly raised in a different faith. We have, though, had to grow accepting of the Pentecostal faith he has maintained on his own. One of the things going on in all this – not especially on the surface – has been a sense of a process of partial atonement. We, with our pale skins and middle class US lifestyles, our undeserved privilege, depending as it does upon a constant flow of resources from the rest of the world, and upon global systems that encourage a number of countries, including those of Central America, to adopt policies that effectively impoverish the people and denude the land. Having Yency has been richly rewarding. By no means a total atonement, but a step on a path. We are always atoning, never atoned – never through with the work of repairing. Forgiveness and reconciliation are our themes of the month for September. We are honoring the Jewish tradition of Yom Kippur, the day of atonement, which is late this year – from sundown on October 7 until sundown on October 8. So we’re preparing for it well in advance.Yom Kippur is the 10th Day of the Jewish New Year, Rosh Hashanah, which begins September 28 this year. It’s a new year for us, as well, in many ways – about this time of year: school started back, labor day, last week our ingathering ceremony, this week the first Sunday of our kids Religious Education program – new year. In the Jewish tradition, you have a period of celebrating the new year, and while it is still fresh – 10 days in – turning attention to atonement: forgiveness and reconciliation.It’s a really good idea. And for Jews this period, Rosh Hashanah and Yom Kippur, is the high holy days. 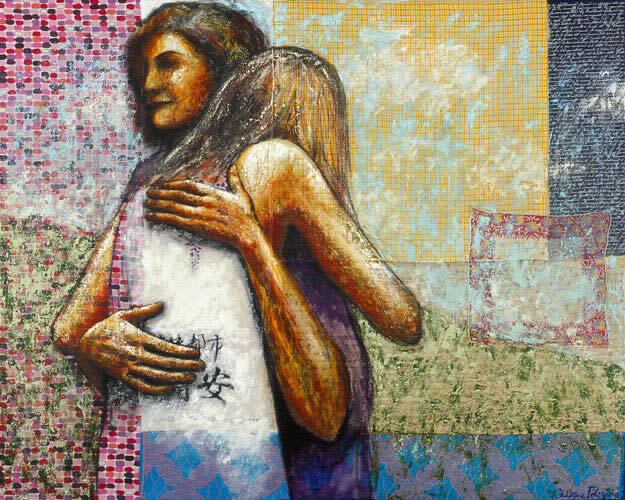 That’s another good lesson: weaving back together the torn fabric of relationship is the most sacred, holy, divine enterprise we can possibly undertake. At the level of interpersonal relationship, there’s no atonement without forgiveness. Forgiving is fore-giving: giving what was before. To forgive is to give back the relationship as it was before. When the offense is slight, we can just say “I forgive you” and it’s done. When the fabric of relationship is ripped through, it will take more than that. I said that forgiveness was a grace -- that is, an unearned blessing. Ultimately, yes, it is unearned. Yet we also have to work on it. We have to earn our way up to the point from which grace takes over. In other words, do the work, but don’t think the work alone is sufficient. It's necessary, not sufficient. If repair to human relationship comes, it comes as unearned grace. Do the work, and see if the miracle happens, the miracle of human reconnection in love. Just saying the words, “forgive me” and the answer, “I do forgive you,” is a start. Only a start. That’s a couple that only began the process. The whole forgiveness thing can have its pitfalls. There are ways that forgiveness goes wrong. First, as in the this case, we might think it is done when it has only begun. Second, forgiveness goes wrong when the forgiver comes off as superior. I say, “I forgive you,” and that can cast me as the magnanimous one, all superior. Rather than return the parties to equality, it maintains a reversed inequality. That can happen when we don’t seek a more extended reconciliation process. Third, forgiveness goes wrong when it is expected or demanded. Recognizing the virtue of forgiveness, we can come to expect or demand that others – or ourselves – forgive. This sense that it’s easy conspires with the awareness that it is noble when it does happen. Let me be concrete about this. Some minister or priest somewhere in North America will, today, tell a battered woman that she should forgive her husband and take him back, no matter how much he beats her, because marriage is forever and good Christians forgive. Here's a situation where an intentional and extended process is required if the relationship is to be repaired at all. Yet a certain concept of "forgiveness" -- as if it were easy and instantaneous -- short-circuits the process that is needed. When the tear is substantial, it will take a lot of sewing to repair it – it doesn’t happen just from saying the words. Even if they are heartfelt words. Tears and emotions of the moment all too quickly pass without commitment to the long-term work. Fourth, things have gone wrong when we give up on the possibility of forgiveness at all. This is the flip side of expecting or demanding it or treating it as if it were an easy and momentary thing to do – a simple act of a moment that sets things right again. Once we see that forgiveness isn't simple and instantaneous, we might go the other direction and give up on it entirely. Don't demand it or expect it -- but please don't give up on forgiveness either. 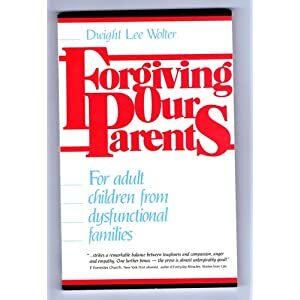 The author Dwight Lee Wolter, was at a book-signing event for his book, Forgiving Our Parents. One person “merely glanced at the title, glared at Dwight and asked, ‘Why the hell should I?’” (Buerhens 6). That’s a person who has given up on forgiveness. We can’t make the grace come. We can take some steps to invite that grace: steps for both the injured and the injurer. For the one who has been harmed, Rebecca Parker writes that the first step is to tell the truth about our pain. We have to be able to say that we’ve been hurt and how. Even articulating that hurt may be arduous. It’s often difficult to speak one’s pain frankly.One barrier is an inner belief in our invincibility. A person may deny her or his own suffering because to hurt is to have an unacceptable weakness. And acknowledging this hurt means recognizing that we can be hurt again. Or we may fear that acknowledging a hurt will make it worse. An Offender Reconciliation Program in Wisconsin “brings the victim of a crime together with the perpetrator of the crime, in front of a trained mediator,” if the victim desires such a meeting, and the perpetrator is willing. One woman met with the drunk driver who had killed her husband. The final step, then, is letting it go. You can’t make yourself let it go, and you certainly can’t make anyone else let something go, but you can deliberately open yourself to inviting the release to come. Letting go releases the violator from the obligation you would place upon them to suffer for their violation, or be punished for their sin. This is not a release from accountability. Forgiveness involves "calling another to accountability, but relinquishing the desire for retribution” (Parker 16). When I say accountability, I’m not meaning taking the consequences. I mean accounting for ourselves to one another – a relation in which we accept the task of trying to make our selves make sense to another human being – who has seen our past behavior as making no sense. The injurer, for her or his part, also has steps that can help open the iron gate through which forgiveness may enter. Here, too, truth-telling must be the first step. Tell the truth about the violation. Acknowledge responsibility. Accept the call to accountability. Step two is justice-making. This is about restorative justice, not retributive justice. “One cannot always repair the damage one does,” writes Rebecca Parker, “but one can commit oneself to create healing or transformation somewhere, somehow” (Parker 21). Conflict can strengthen a relationship, or strain it. Conflict can get to the point where it is hard to say what the conflict is about – what exactly is the issue – because the energy of the conflict is oriented toward other people rather than the issue. You talk to the people involved, and you find you’re having a hard time getting a handle on the issue, but it’s real easy to tell the sides – “those people” this and “those people” that – then you’ve got a high level of conflict. When we feel in our hearts, “those people won” or “we showed those people” then we’re in deep need of a process of forgiveness. “Nothing we do, however virtuous can be accomplished alone. No virtuous act is quite as virtuous from the standpoint of our friend or foe as from our own. The miracle of Reconciliation can happen, and our flourishing, the blooming of our beloved community springs from the ground of that reconciliation. It makes sense, then, that the day of atonement and reconciliation, is not only the holiest day of the year, the most solemn day of the year, but also the most joyful day. Less than a year later, we find ourselves here again on the precipice. Or, still here, stuck, gripping tight, holding on for dear life, too afraid to free a hand to reach for the way up or out. No rescue helicopters flying in here. No lessons learned. No truth telling. Each holding tight to our own stories and to the rocky cliff.